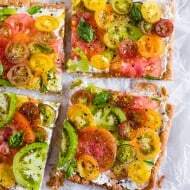 Back in April I went to King Arthur Flour for a fun little baking adventure. I wrote about it on the blog but there was one thing I didn’t mention. The totally delicious vegetable chili that was served to us at lunch. Now, I didn’t have the exact recipe they used so I sorta altered a solid recipe I found until I came up with the flavor I wanted. 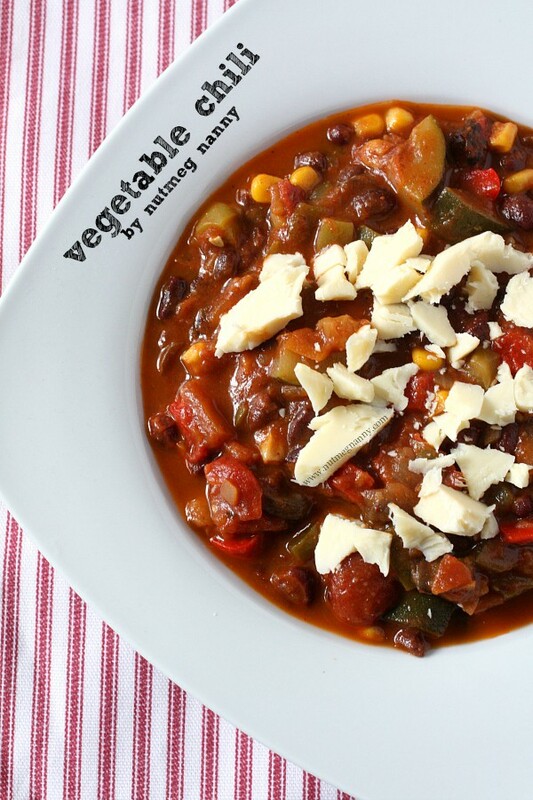 I packed this easy vegetable soup full of fresh vegetables and lots of smoky spice. I have recently been having a love affair with smoked paprika so it made a very delicious appearance in this soup. I cannot tell you how much I used to underestimate the amazingness of paprika. Growing up I thought it was just some flavorless spice that my Aunt Lyn used to sprinkled on top of her “famous” deviled eggs. Then I tried smoked paprika and realized the stuff freaking rocks. Now, if you want to keep the soup vegan than skip out on the sprinkling of sharp cheddar. However, if you are cheese lover I suggest using it. You cannot go wrong with sharp cheddar. Since I have gotten back from Vermont I have been eating obscene amounts of Cabot cheese. It’s getting bad. Almost daily I find myself devouring cheese. Trust me when it’s say it’s not classy either. I’m not delicately putting it on a board with some sliced apples and crackers. I basically chop off a hunk and eat it like I’m scared someone is going to steal it from me. Pure class ladies and gentleman. Add a large soup pot over medium-high heat and add olive oil. When the oil is hot add onion, red bell pepper and green bell pepper. Cook until the vegetables start to soften. Add in garlic, zucchini, corn and mushrooms. Cook until the vegetables are soft and add in chili powder, cumin, smoked paprika, salt, cayenne, tomatoes, vegetable stock and black beans. Bring soup to a boil, reduce the heat and simmer for 20 minutes. Stir in cilantro and add more salt if necessary. If desired serve sprinkled with sharp cheddar cheese. *While I am friendly with the folks at Cabot I was not paid or asked to say anything about their cheese. It’s just really awesome and I wanted to spread the cheese love. Looks delicious and perfect for this time of year! A smother in cheese is a must, and I say the sharper the chedda, the betta (love Cabot’s extra super duper sharp. Heavenly!) KAF rocks my socks, and this chili looks like a big ol’ bowl of cold weather comfort. Looks perfect!! And the cheese….hello delicious!! This chili looks so GOOD! And the cheese… a must! I want a big bowl right now. 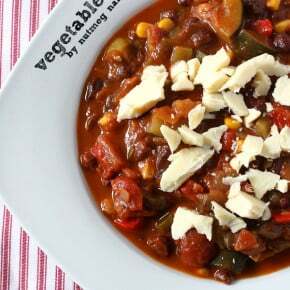 I’m pretty much always up for a good veggie chili! With cheese on top. Always with cheese. Oh my, how delicious! It looks so hearty and amazing. I’ve been trying to figure ways to get my son to eat more veggies. The vegetables have to be soft, so this is just the thing! Thanks for the great recipe, Brandy! I made this tonight and it was perfect! Just the fresh vegetables my family needed. Thanks for the great recipe Brandy! 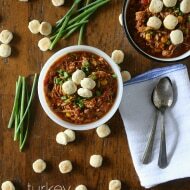 though i’m nowhere near vegetarian, i can appreciate a hearty meat-free batch of chili–this looks great! 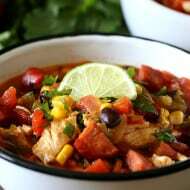 My guys love chili and I know this would be a huge hit! What a gorgeous bowl of chili. Perfect for the cold months ahead. This is my kind of cold weather meal!!! Looks amazing!